Italian looks forward to final week after consolidating on Mont Ventoux. Although Astana’s Fabio Aru proved unable to join Richie Porte (BMC) and Bauke Mollema (Orica-GreenEdge) in tracking Chris Froome's (Sky) awesome assault three km from the summit on yesterday’s shortened stage 12 to the Mont Ventoux, he confidently settled into a strong chasing group alongside pre-race favourite Nairo Quintana (Movistar) and young sensation Adam Yates (Orica-GreenEdge) and fought valiantly to limit his losses. In the final kilometre, Aru's group surprisingly surpassed Froome, who was brought down by a crash involving a television motorbike and forced to run along the road as he waited for a replacement bike. The Italian went on to place 12th at the finish at Chalet Reynard, just behind Yates. Talking to reporters as he warmed down after the stage, Aru had no clue what had happened to Froome – "I was 200 metres behind them, I didn't see anything" – but he declared himself satisfied with his showing. "Today was very hard again, like every stage of this Tour. 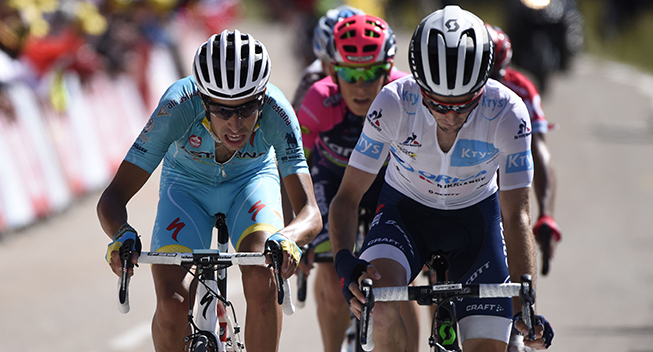 There was a lot of wind during the stage and again on the climb, it wasn't easy," said Aru according to Cyclingnews. Aru experienced a thoroughly trying day personally, having endured the misfortune of requiring two bike changes just as the wind-buffeted peloton was splitting into echelons on the flat. He succeeded in making it back to the peloton, albeit with sufficient aid from his team car to earn a fine from the commissaries on Thursday evening. "Considering the extra efforts I had to make because of my mechanical problems, I can be satisfied. I think it was quite a good day for me in the end. It wasn't easy to get back on, but I had teammates with me when my bike broke and when there's harmony like that in the team, it makes things a bit more straightforward." Aru crossed the finish line 1’21” ahead of Froome and at first moved to within 14 seconds of the Brit in the provisional general classification issued immediately after the stage. After drawn out discussions, though, the commissaires decided to amend the general classification and award Froome the same time as Mollema, meaning that the Sky captain keeps hold of his overall lead, extending Aru's deficit to 1’54”. Trailing Froome by almost two minutes going into Friday's individual time trial didn't put off Aru, however, as he pointed to the tough stages awaiting the riders and emphasizing the need to enter the Alpine stages with fresh legs. "I'm feeling quite good, you know," Aru said. "The harder stages are coming and you start to feel the fatigue now that we're twelve stages in. The last week is very hard and it's going to be important to get there fresh."